This image was taken by the European Photon Imaging Camera (EPIC) on ESA's XMM-Newton X-ray space observatory, and marks different patches of gas in different colours. 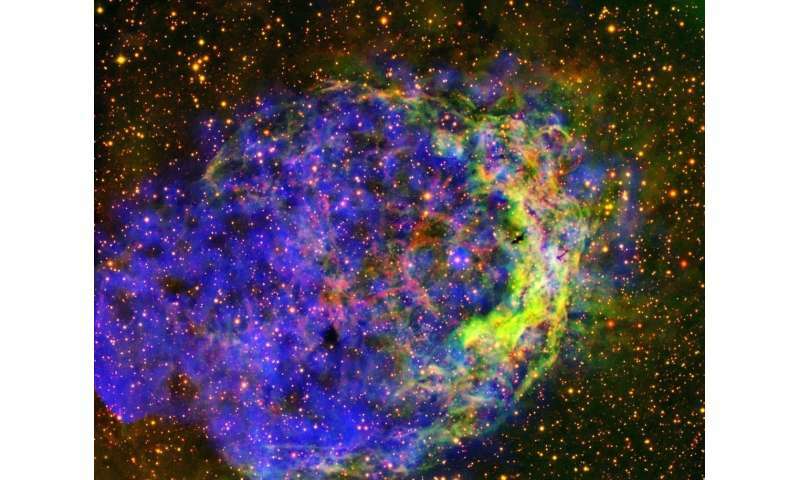 The incredibly hot, diffuse, X-ray-emitting gas within the Wolf-Rayet bubble is shown in blue, while a bright arc that is visible in the optical part of the spectrum is traced out in shades of yellow-green (oxygen emission) and red (sulphur emission). This blue and yellow-green component forms an optical nebula – a glowing cloud of dust and ionised gases – that stretches out towards the western end of the X-ray bubble (in this image, North is to the upper left). This lopsided arc caused astronomers to previously identify WR18 as a so-called runaway star moving far faster than expected in relation to its surroundings, but more recent studies have shown that the observed X-ray emission does not support this idea. Instead, the shape of NGC 3199 is thought to be due to variations in the chemistry of the bubble's surroundings, and the initial configuration of the interstellar medium around WR18.